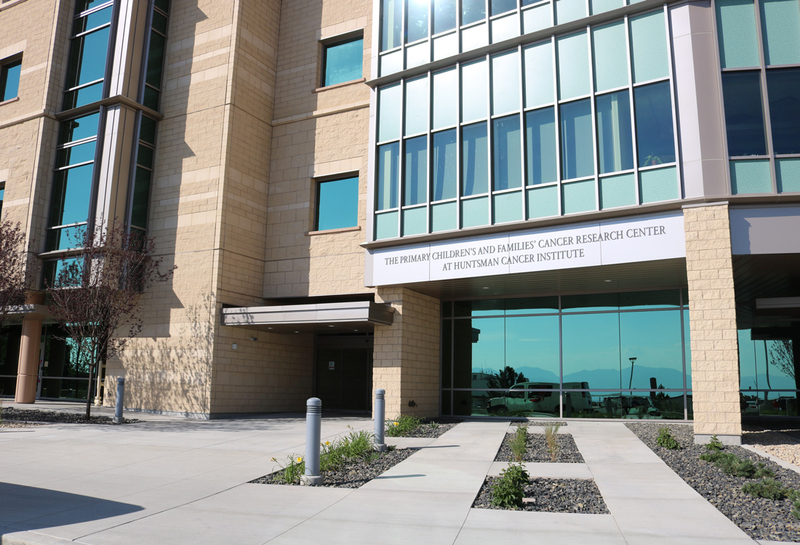 The Primary Children’s and Families’ Research Center at Huntsman Cancer Institute is intended to extend the institute’s study of cancer treatment and prevention, particularly pediatric cancers of the bone, blood and brain, according to Mary Beckerle, its Executive Director. What a inspiring, worthy and lofty mission to be able to collaborate on a facility to do this work. Stippich Design collaborated with the Huntsman Cancer Institute, Huntsman Cancer Foundation, Architectural Nexus, and Jacobsen Construction to develop, design, and manufacture the exterior building identification, interior signage and wayfinding package, and the donor recognition package. 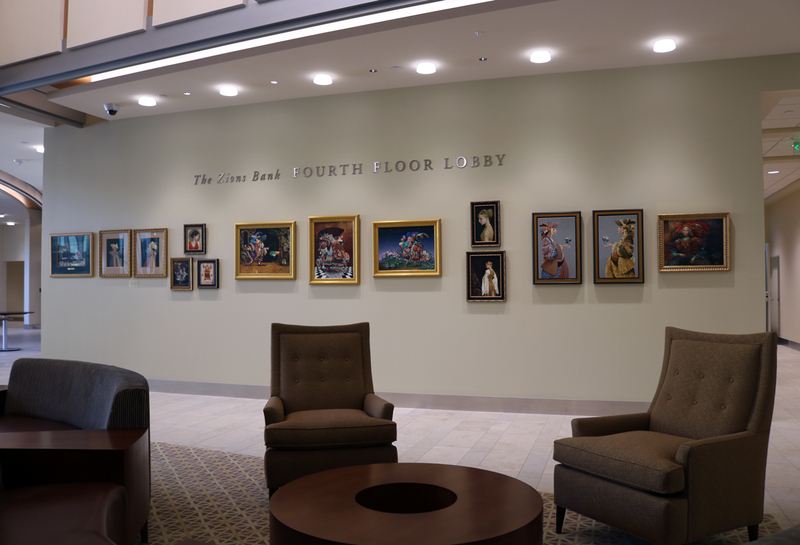 Our collaboration with the various entities began with how to keep the design principles of the interior signage package and donor recognition of the Huntsman Cancer Institute and update it for The Primary Children’s and Families Research Center at Huntsman Cancer Institute. Because of the passage of time much of the materials and changes to the ADA (Americans with Disabilities Act) required using different materials and implementation of communication information in the updated signage package. 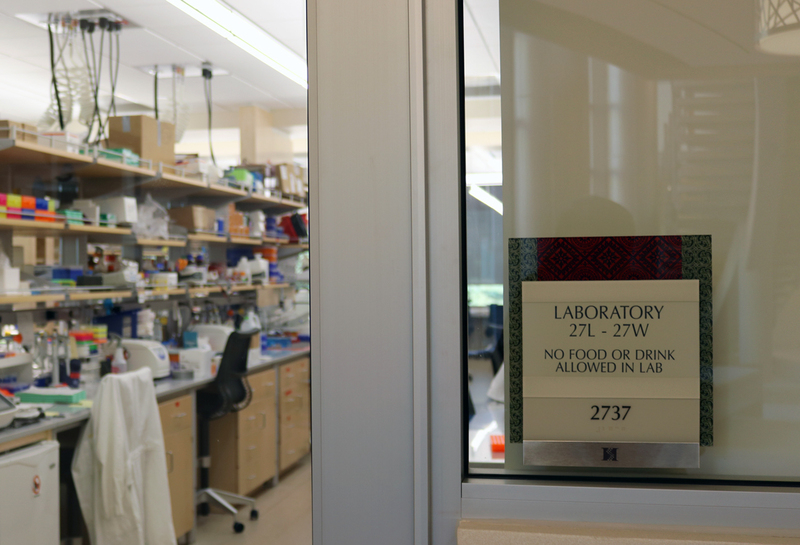 The original signage package and donor recognition package for the Huntsman Cancer Institute had as a major design element fabric sandwiched between pieces of glass or acrylic which then had the communication information placed on the acrylic. Overtime the fabric had stopped being made and changes to the ADA required a greater contrast between background imagery and communication information. Our team took from the fabric that existed and recreated digital vector graphic files of those fabrics so they could be manipulated and adjusted as needed for various items and uses. 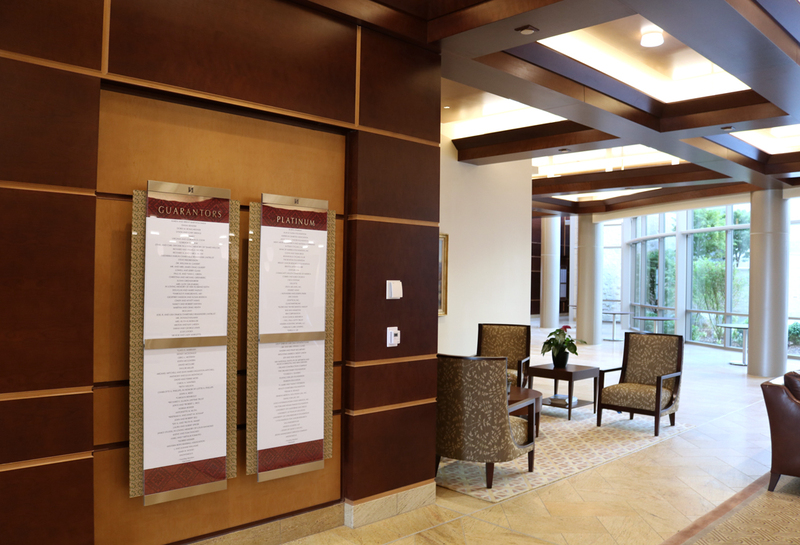 These graphical images became the design element for the backplates of the interior signage and donor recognition scrolls used in the building. The graphical images of the recreated fabrics were printed directly on to acrylic. In the original signage package the tactile and braille communication information was placed directly over the top of the fabric which with the ADA standards of today would not be allowed. The original signage package also had a beige sign face element which contained communication information which could be changed as the use of a room changed. In the updated design our design team in collaboration with the various entities sectioned the sign face in to two parts. A tactile and braille section at the bottom of the sign which would display the room number communication information and meet ADA standards of today and a insert section where they could insert a piece of clear material printed with the communication information by staff at the Huntsman Cancer Institute. The final design update was stainless steel plates screen printed with the Huntsman logo on it as a branding element. In the intervening years between when the Huntsman Cancer Institute first opened and when The Primary Children’s and Families Research Center at Huntsman Cancer Institute opened. The Huntsman Cancer Hospital was brought into existence. Stippich Design worked collaboratively on that project with the Huntsman Cancer Institute, the Huntsman Cancer Foundation, and Architectural Nexus to develop, design, and manufacture Exterior Building Identification, interior signage and wayfinding packages, and the donor recognition package. One of the design criteria was to include in the packages a branding element. In collaboration with the various entities through a process of looking at a range of solutions the logo appearing on a piece of stainless met the goals of having a branding element that was subtle and related materially to the architecture of the building and quality of the Huntsman brand.